Tug, trawler, or tanker. 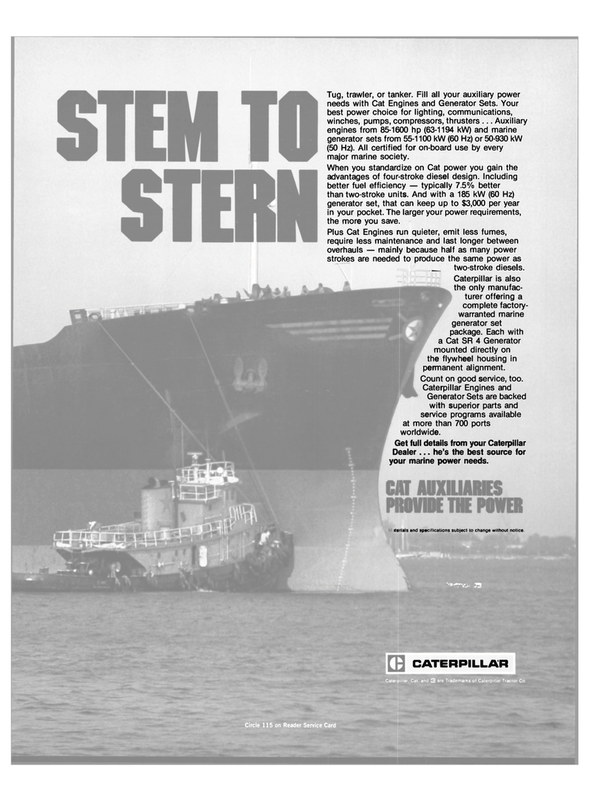 Fill all your auxiliary power needs with Cat Engines and Generator Sets. Your best power choice for lighting, communications, winches, pumps, compressors, thrusters ... Auxiliary engines from 85-1600 hp (63-1194 kW) and marine generator sets from 55-1100 kW (60 Hz) or 50-930 kW (50 Hz). All certified for on-board use by every major marine society. When you standardize on Cat power you gain the advantages of four-stroke diesel design. Including better fuel efficiency — typically 7.5% better than two-stroke units. And with a 185 kW (60 Hz) generator set, that can keep up to $3,000 per year in your pocket. The larger your power requirements, the more you save. Plus Cat Engines run quieter, emit less fumes, require less maintenance and last longer between overhauls — mainly because half as many power strokes are needed to produce the same power as two-stroke diesels. Caterpillar is also the only manufac- turer offering a complete factory- warranted marine generator set package. Each with a Cat SR 4 Generator mounted directly on the flywheel housing in permanent alignment. Count on good service, too. Generator Sets are backed with superior parts and service programs available at more than 700 ports worldwide.